I was excited to have the opportunity to review this book! There are so few books written by modern authors that I enjoy, and so I was looking forward to finding something new to read that is also clean and uplifting. I wish I could honestly say that my high expectations were met, but unfortunately, being a frequent reader of classic literature has probably spoiled me. One of my pet peeves of modern, historical fiction is that most, if not all, of these stories are inundated with modern sensibilities that simply did not exist in the past. Of course, I know the reason that the writers of today make this choice, (I believe it's an attempt to help modern readers "relate" better to the characters and their world) but I have not been able to find a way to keep it from ruining the reading experience for me, personally. I subscribe to the school of thought that says that in order for modern readers to understand the past, they need to be immersed in it, rather than expecting the past to change to meet their understanding. The heroine ogling her romantic interest's body. More than once. How difficult it was to relate to, understand, or even LIKE the heroine. The outlandish actions of the heroine's mother, knowing that she never would have been tolerated in society at that day and age. The author is a fine writer, but the story was also fairly disjointed, and it did not hold my interest. I had to FORCE myself to return to the book several times. Unfortunately, after reading this modern take on a historical romance, I feel the need to read an Austen novel, or something by the Bronte sisters. 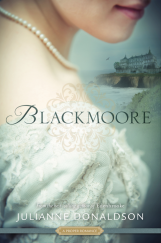 I honestly cannot recommend that my readers waste their time reading Blackmoore-- immerse yourself in a wonderful classic, instead!